The Edinburgh Trams service has been running for 100 days and 1.5 million passengers have been welcomed on board to date. Patronage figures and revenue levels are in line with predictions and importantly with the business model which was developed before operations began. The service experienced an extremely busy launch period with around 130,000 passengers in the first week followed by regular weekly average patronage in excess of 90,000. 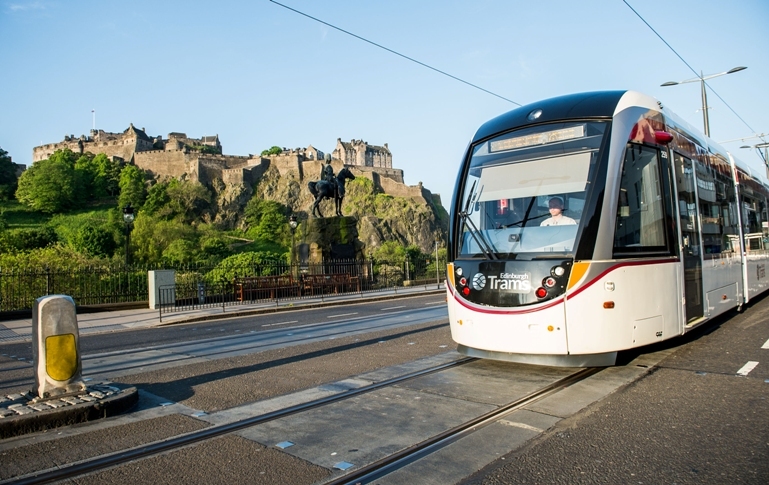 Major events including the One Direction Concert, two Champions League games and one of Edinburgh's busiest ever festival seasons have boosted numbers and given Edinburgh Trams the opportunity to address emerging issues and develop and improve the service along the way. "I'm very pleased with progress so far and with 100 days of the tram service under our belts, coupled with record breaking patronage on Lothian Buses, we're well placed to thrive as a modern integrated transport operator. What we're seeing suggests a genuine increase in use of public transport across the piece which is a priority for us but also a shared aspiration for many in the city." "We can count these 100 days as a very encouraging start and the fact that we've carried 1.5 million passengers speaks volumes about how quickly people in the city have embraced their new tram service. "These are still the early days of a new operation and there's always going to be scope to refine things to make sure passengers get the best possible service. We've got a great team in place to hone and develop the tram operation and to ensure that we deliver a fully integrated public transport system for the Capital." "The last 100 days have been a success for everyone at Edinburgh Trams, from our drivers and ticketing assistants to the team behind the scenes at Gogar Depot. We've had major events, a busy Edinburgh Festival season as well as challenges and disruptions that are part of being a transport operator. I hope passengers feel they can count on us to get them to their destination and we continue to listen to feedback from our customers which we're using to improve our service further. "We're off to a really promising start and I'd like to thank all our staff etc for their efforts and our new passengers for getting on board with us." Despite some high profile events and service interruptions, 98.7% of trams have completed full route journeys since the start of operations. Scottish National Entitlement Card use is currently within the Council's £500,000 budget for the financial year, equating to around 10% of journeys.